Pardons Canada is a non-profit organization that has become the leading authority on Record Suspensions, File Destructions and U.S. Entry Waivers. As a matter of fact, we have helped over 200,000 individuals since 1989. The aftermath of a criminal conviction in Calgary can follow you for years after the sentence has been served. Because of it, you may have trouble getting a job or advancing in your current position, traveling to other countries including the U.S. or renting a home or an apartment. This type of discrimination against someone with a criminal record is entirely legal. However, the same kind of discrimination directed at someone without a criminal record or whose record has been pardoned or suspended represents a human rights violation. A Record Suspension is the removal of a person’s criminal record from the Canadian Police Information Centre (CPIC) database. The determination of whether or not a suspension will be granted is made by the Parole Board of Canada and can take 12 to 24 months. A request can only be filed after a required waiting period during which the individual has demonstrated they are a law-abiding citizen. Travel to the U.S. with a criminal record can be difficult. From time to time, U.S. customs officers will perform a criminal check for individuals entering the United States. Should they uncover your criminal record as you’re trying to cross the border, you will be detained and most likely turned away. Repeated attempts to enter the U.S. could lead to more serious repercussions since it would be assumed that you were aware that such an effort was contrary to U.S. federal law. The INS will consider applications for U.S. Entry Waivers for individuals with a criminal record. This can be particularly useful for Calgarians who wish to travel to the U.S. before a Record Suspension can be granted. It is important to note that the preparation of the application and its accompanying documents may take several months and that the review process by the INS takes time as well, so it is best to begin the process as far in advance of your travel plans as possible. When an individual is charged with a crime, they are fingerprinted, and a record of the charges is created. If that person is subsequently acquitted of the charge or if the charge is dismissed or withdrawn, a record of the charge along with the police report may still exist and could show up on a criminal check. Despite never having been convicted of the offence, this could still cause problems in the future. Thankfully, it is possible to submit a request to the RCMP and the local Calgary police to have the files destroyed. This will ensure that the individual’s criminal record remains clean and that the charge will not appear should anyone perform a search. 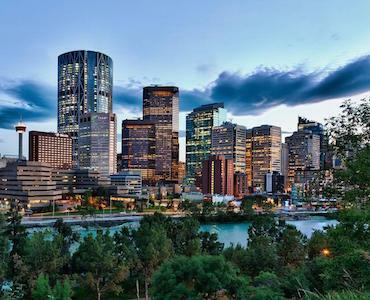 The counsellors at Pardons Canada have all the experience and know-how to assist you in preparing your application for a Calgary Record Suspension, File Destruction or U.S. Entry Waiver. Call us toll-free at 1-877-929-6011 Monday through Friday between 6:30 AM and 3:00 PM (8:30 AM and 5:00 PM Eastern Standard Time).